Small mixed badger and boar hair shaving brush with a solid resin handle. Ideal for travel use due to its small size. This little devil combines the backbone of a boar brush and the softness of a badger one. 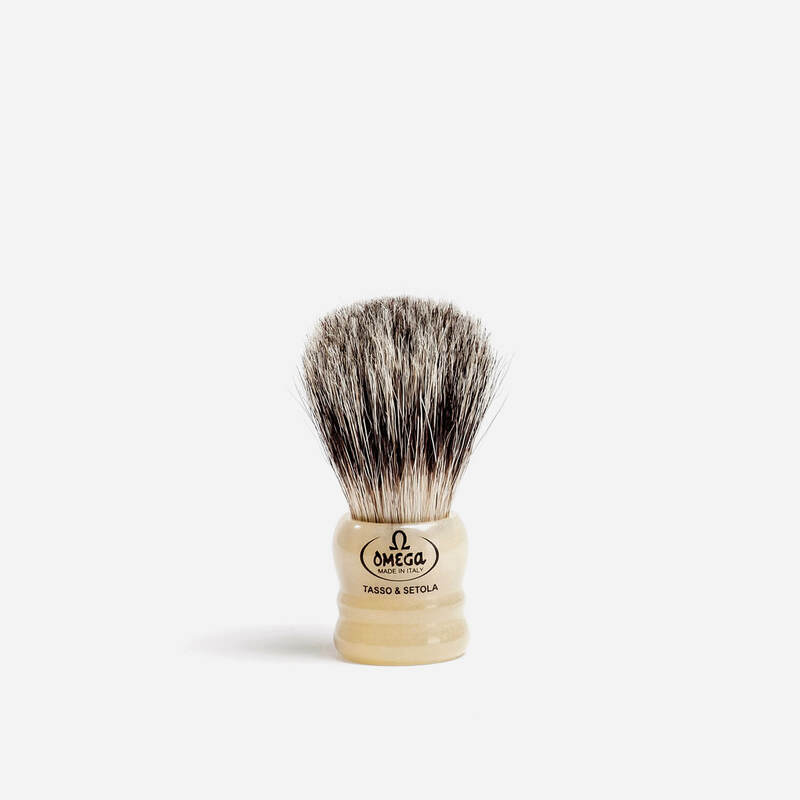 Triple milled soaps, croaps or shaving creams make no difference at the ease of lathering with this Omega. It is a petite brush but with firm grip, and the swirls of the resin handle are beautiful. You may buy it as a travel brush due to its size, but it will definitely be part of your brush rotation. On another note, excellent service from Shavelounge! Very small brush, probably best for traveling! Absolutely love this brush. Makes/holds a great lather. Soft and stiff in the same brush, so comfortable but really gets the lather into the skin. Most of the size reduction is from the handle; the bristles are, I think, the ideal length, particularly for face-lathering, which this does very well indeed. I bought this purely because of its size. I inherited a vintage travel kit and the brush was falling apart. I was after something of good quality that would fit in the existing container. I’ve been amazed at how good this little brush is at working up a lather. Despite its diminutive dimensions it feels good in my large hands and has an air of quality about it. In short, I’m very pleased with this purchase. The bristle mix is almost unnoticeable. Excellent little travel brush! Today I got this brush- and it’s amazing. It has backbone appropriately and density. Mighty midget breaks hard soaps and soft soaps and cremes very good! Highly recommendable product! lovely little brush, little being the main idea! next stop; it’s silvertip brother, the omega 599! Like others, I got this as a travel brush. Breaking it in, I found it really comes into its own for face lathering. My larger EJ best badger is great for bowl lathering and face painting. The Omega doesn’t produce quite as much bowl lather; but the backbone generates lather really well on the face. I use TOBS Sandalwood and Proraso menthol. Great service from Shavelounge as always. Bought this to complement my Proraso professional brush. It’s a cracking little brush that’s smaller than my other brush but performs just as well with a slightly softer feel to it. Once again excellent service from Shave Lounge. Excellent brush and great service! Excellent little brush ideal for travel great quality great price.